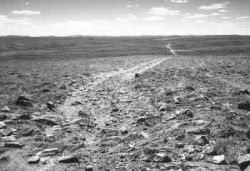 South Pass served as the primary mountain gateway to the West for emigrants traveling the Oregon Trail during the great westward migration of the mid-nineteenth century. It was at this site that the route traversed the Continental Divide and deposited the emigrant traveler into what was considered to be the beginning of ''Oregon Country.'' The area known as South Pass is located in west-central Wyoming, approximately ten miles southwest of South Pass City in Fremont County. The pass itself is located on the northwest edge of the Wyoming Basin--a desert-like geographical feature which extends south for 150 miles and forms a complete break in the Rocky Mountain chain. While it was feasible to cross at any point along this 150 mile break, wagon trains of emigrants traveled through South Pass because of its numerous creeks and the availability of water in an otherwise dry desert terrain. The divide at South Pass is rimmed on the north by the Wind River Range, and on the south by barren hills, creating a broad, sagebrush-covered plain some twenty miles wide. The pass through the mountains was so gradual in its ascent that most emigrants were not fully aware of having crossed the Continental Divide until they had reached Pacific Springs three miles beyond the summit. It was there that travelers could observe for the first time water flowing west toward the Pacific Ocean, signifying their crossing over the pass and into Oregon Country.